Transformer Receives the Mayor's Arts Award for Excellence in Artistic Discipline! 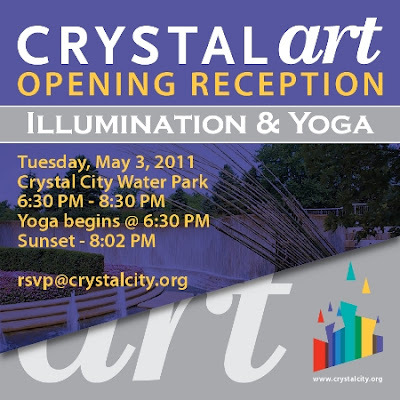 Transformer was awarded the Mayor's Arts Award for Excellence in an Artistic Discipline on Wednesday evening April 20, 2011 as part of a ceremony at the Kennedy Center to celebrate the arts in our nation's capital. The Mayor's Arts Awards are the most prestigious honors conferred by the city on individual artists, organizations, and patrons of the arts. Each year, the DC Commission on the Arts & Humanities invites citizens to nominate these outstanding artists and arts organizations. "I am honored to accept this award for Transformer on behalf of all the many artists we have worked with since our inception in 2002. We share our thanks for the award with them, as well as with the DC Commission on the Arts & Humanities for their continued support, and our amazing community of audience, donors, and foundation sponsors for helping to make our work a reality!" states Victoria Reis, Transformer's co-Founder, and Executive & Artistic Director. For a complete list of Mayor's Arts Award winners, click here. The show LIMINAL LIGHT at Project 4 Gallery features artists who explore various means of representing reality and the boundaries beyond, bringing the viewer to the visual realm of the sublime. Using graphite, India ink, smoke, and photo collage the artists exploit the duality between black and white to reveal the spectrum of infinite shades of gray. The featured artists Matt Ballard, Mayme Donsker, Christine Gray, Loie Hollowell, and Ander Mikalson each explore light and dark with various monochromatic media used both traditionally and expansively. The light implied or described in these works intensifies, wanes, or pulses using simple means of production. Although each artist focuses on different subjects, their work is unified by a desire to question notions of reality. Spring Focus Exhibitions @ G.R.A.C.E. G.R.A.C.E. Spring Focus Exhibitions features three regional artists whose work addresses contemporary social themes. In Delights From South America, Carolina Mayorga explores political and social upheaval through video, installation, and performance. The video and posters juxtapose images of a breezy, stereotypically dressed woman (the artist) provocatively offering fruits. Heidi Neff portrays American political divisiveness through an installation of ninety-eight paintings – Fire and Ice. The artist created ninety-eight individual panels and separated them into two rooms, each roofed with an elaborate ceiling panel. The “Fire” room is devoted to “liberal” issues and the “Ice” room relates to conservative viewpoints. Andrew Zimmermann uses black and white photography to investigate unseen suburbia – specifically the one-mile radius surrounding his home in Common Place. Common Place upends the usual view of suburban landscapes as nondescript, monotonous tracts by documenting their quiet surprises. Using a large format view camera Zimmermann photographs scenes from his Arlington, Virginia neighborhood that most of its residents would probably overlook. Super Studio! Hands-on Workshop for ages 6– 10. Speaking of Art / performance and presentation by Tristan Perich. The performance and talk will be held in the Grand Ballroom Lounge, on the 1st floor of the Stamp Student Union at 5:30pm, Wednesday April 27, 2011. 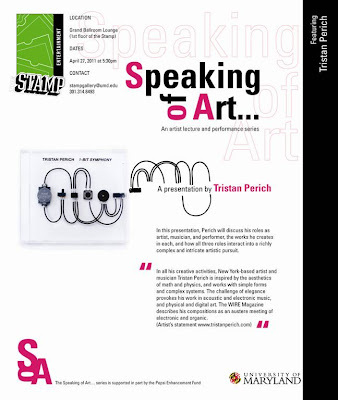 Check out the artist at www.tristanperich.com. Spring is far enough along in parts of the country that it seems appropriate to talk about the color of the season: green. It's a color that has come to take on many meanings — envy, ecology, money and more. A new exhibition at the Textile Museum in Washington, D.C., celebrates green's symbolism. The show is called Green: The Color and The Cause. n New Jersey, artist Nancy Cohen explored ecological green in the state's waterways. She traveled along the Mullica River, on foot and by boat, and "spent some time meeting with marine biologists and environmentalists," Cohen says. "The water is a brownish color because cedar trees leach into the water, and even though the water's clean, it has a kind of tea color. As the river progresses and moves toward the ocean, it becomes bluer and bluer." Arbor Day fittingly, the exhibition highlights how two sisters see themselves in and out of nature. The artists will show their interpretations of the deep in the woods of the Berkshire Hills to the shores of sand and rock in Cape Ann, both situated in the Commonwealth of Massachusetts. 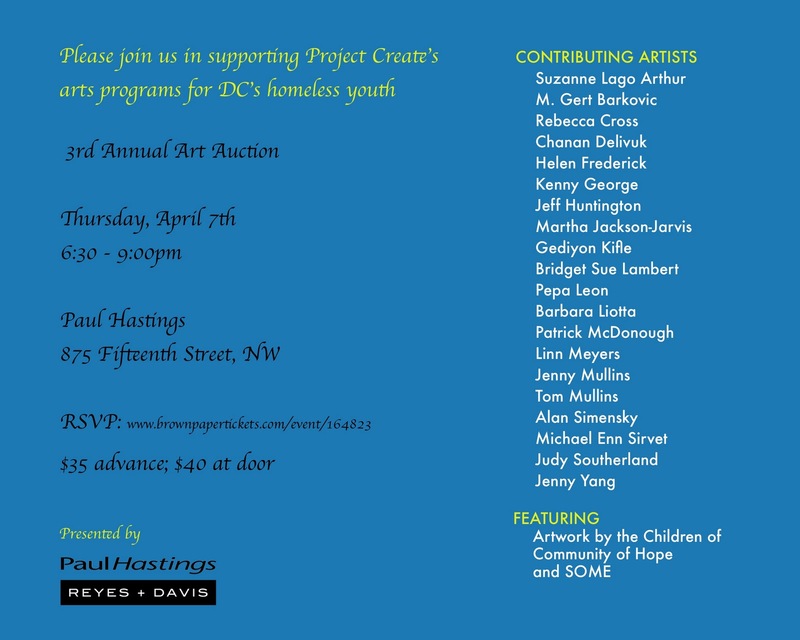 Parish Gallery: Georges M'Bourou "Roots of Hope"
The first and only Live Auction of Artistic Experience ever held in Washington! An evening of auction fun, both silent and live, hors d’oeuvres, music, cash bar, & live performances in a Washington landmark that many have seen, but few have entered. Admission is $35 for members of DCAC and $50 for non-members. Tickets are going fast! Get yours now! The Experience Auction – because things you get to do are better than stuff you have to have. Helen Zell, private collector and past chairman of the Board of Trustees at the Museum of Contemporary Art Chicago, presents From Paper Dolls to La Poupée-a talk aimed at collectors both novice and experienced. This annual series provides insight and advice on collecting art from museum directors, curators, collectors, art dealers, and consultants. This was filmed between 4th and 11th April 2011 at El Teide. D.C. Art Science Evening Rendezvous (DASER), was conceived as a monthly discussion forum on art and science projects in the region to provide a snapshot of the region's cultural environment and foster interdisciplinary networking. On the evening of April 22nd - Earth Day event and closing party for the exhibition Green Works. The event will feature a panel of local green experts who will share the secrets to their success and ideas for living eco-friendly from lifestyle to community. Meet the panelists and view Green Works from 6:30 -7:30pm. The panel discussion will start promptly at 7:30pm. We look forward to seeing you there! This is also the last chance to view the GREEN WORKS exhibition. 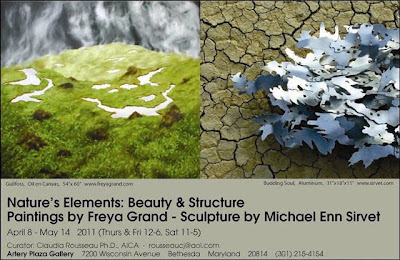 The show features artists Heidi Fowler, Sayaka Ganz, Julia Anne Goodman, and Duncan Johnson who create extraordinary pieces that capture the grace and beauty of the natural world using man-made and found objects. Grazia Toderi likens her video projections to "frescoes of light." Best known for large-scale installations, the artist works from documentary imagery collected from urban night surveillance and military, satellite, and space program footage. Over these she superimposes her own photography and cinematography, altering the effect with digital manipulations and unifying the vista with sepia-tone filters. On the opening night of Directions: Grazia Toderi, the Italian artist introduces her recent projections and drawings which transform the artifacts of a culture obsessed with technology and surveillance into celestial meditations both poetic and chilling. The exhibition will be open prior to the program. An interview with artist and author Tom Block is published in Read the Spirit with information about his new book Shalom/Salaam: A Story of a Mystical Fraternity. Images of medieval mystics who influenced each other, painted by Tom Block, illustrate this interview.The book is a good read on understanding the interrelationship between the two religions. TOM BLOCK’S WEBSITE: Here is the homepage for artist and author Tom Block. “Shalom / Salaam,” here’s a direct link to the “Shalom / Salaam” project. April 27, 2011 is Advocacy Day! DC is facing a budget crisis, and we need all voices to support the Arts and Humanities in the District! Join DC Advocates for the Arts, the Humanities Council with residents from all 8 Wards, Busboys & Poets, the Sunlight Foundation, the Washington Bach Consort, Grasshop, and the H Street Playhouse for Advocacy Day. On April 27, volunteers will visit members of the City Council and ask them to support funding for the Arts and Humanities. Advocacy Day training sessions are Tuesday, April 19 from 9-10:30 a.m. and Wednesday, April 20 from 4:30-6 p.m. at the Humanities Council (925 U Street NW). 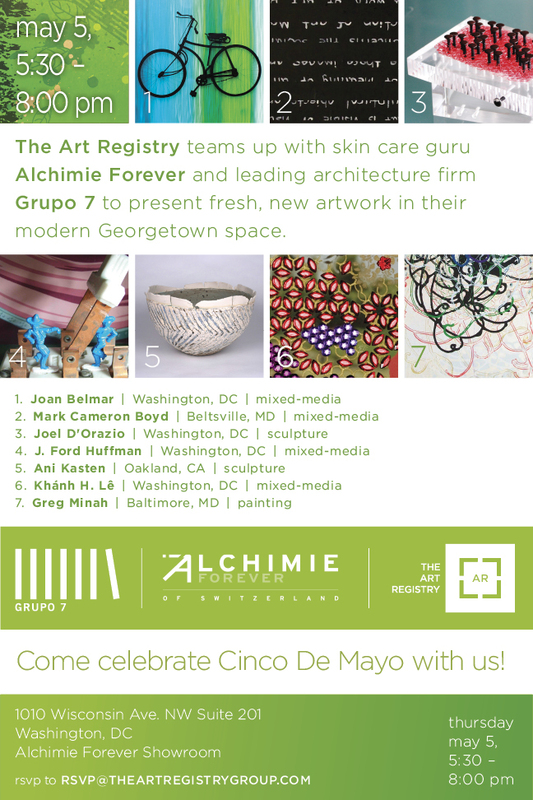 To register, email steering[at]dcadvocatesforthearts.org. 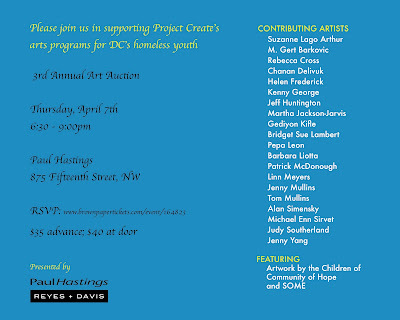 For more information, please visit: DCAdvocatesForTheArts.org. Chloe Watson uses acrylics, colored pencil and contact paper to create abstract imagery of familiar spaces that creates a dialog between indivividual memories and collective spaces. The stripping of details, save for patterns which serve as a surrogate for the real, form highly geometric representations, which become spaces for reflection and the projection of experience. Opening reception: Saturday, April 16th, from 7 p.m. to 9 p.m.
5:30 p.m. on Saturday, April 16th. Call + Response, the art exhibition that pairs writers and artists, is returning to Hamiltonian Gallery for a second installment opening April 16, 2011. For this new show, named Call + Response: Textures, four writers and four visual artists have paired to create artworks that resonate with each other. Call + Response: Textures builds again on the theme of "call and response," a succession of two distinct phrases played by different musicians in which the second phrase comments on or responds to the first. In each pairing, the writer provides the "call" in the form of a new, intense piece of short fiction or poetry. The visual artist creates the "response" by creating an installation in the gallery. The result is paired works that resonate with each other, building a bridge between two distinct but fertile communities. Displayed together, the works benefit from their proximity and invite the viewer to observe and appreciate connections or disjunctions. Building on the success of last year's Call + Response, curators William John Bert and Kira Wisniewski have partnered again with Hamiltonian Gallery. They increased the palette size, giving writers a longer word count and inviting the artists to create large installations. "We are delighted to be working with Hamiltonian Gallery again and especially with this extremely talented roster of individuals," says Wisniewski. 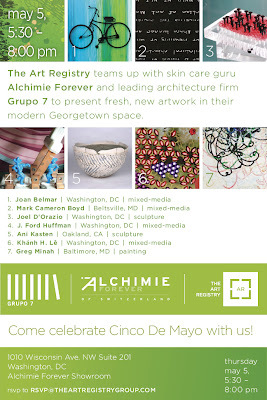 For a complete list of pairings and participant bios, please visit http://www.callandresponsedc.org. Georges Mbourou is one of Gabon's most celebrated contemporary artists. Mbourou's paintings are essentially a quest into the mystery of light. He is known for his unique and instantly recognizable style of oil on canvas, which incorporates vibrant color combinations and explores different textures through paint layering, dripping and scraping. His paintings range from totally abstract, to the transformation of traditional elements and motifs onto canvas, such as life scenes, women's faces, the creators and keepers of culture; animal totems and sacred objects associated with secret initiation rites; and masks representing the presence of Life itself within the intricate web of creation. Parish Gallery primarily, but not exclusively, represents contemporary visual artists of significance from Africa and the African Diaspora. In selecting art and artists, Parish Gallery exercises high ethical, curatorial and market selection standards, catering to the spirit of social preservation and regeneration in collecting the art. Parish Gallery is open Tuesday thru Saturday from noon to 6:00 PM or by appointment. Global Africa is a series that presents international artists who are engaging with Africa in their work. New York-based artist Kehinde Wiley talks about his portraits of contemporary urban African, African American, and Afro-Brazilian men in heroic poses. Painted in the style of Old Master portraits, these works reveal aspects of urban identity around the world. Wiley focuses his discussion on his World Stage: Lagos-Dakar series and his recent portrait series of African footballers from the 2010 World Cup. A conversation between Wiley and renowned D.C.-based Nigerian artist Victor Ekpuk follows the artist’s discussion. Seraphin Gallery announces Gallery night in conjunction with the Philadelphia International festival of the Arts. The gallery will host events on the evening of April 15th in the spirit of inter-disciplinary artistic practices promoted by PIFA. Cellist Steve Kramer & Clarinetist Anne van Oosten playing Beethoven, Hindemith, and more at the gallery. Kramer has played for the Royal Danish Symphony Orchestra and the Amsterdam Symphony Orchestra. Van Oosten has studied at the Schumann Academy for Music in Amsterdam and won a Fulbright award at the University of Pennsylvania. Sculptor and video artist Cosimo Cavallaro will show the video "Piano Burning" on the gallery walls. The video is a two hour presentation which will allows for walk-ins to view the work at their own leisure. Cavallaro has shown at the Cedarhurst Sculpture Museum and the Krasel Art Center in Chicago, Illinois. His "My Sweet Lord" sculpture, depicting a life size Jesus Christ made of chocolate, has been featured in numerous news outlets including the BBC, CNN, and The Fox News Channel. Seraphin Gallery is located at 1108 Pine Street. The gallery is open from 11am - 6pm Tuesday though Sunday. Admissions is free and open to the public. 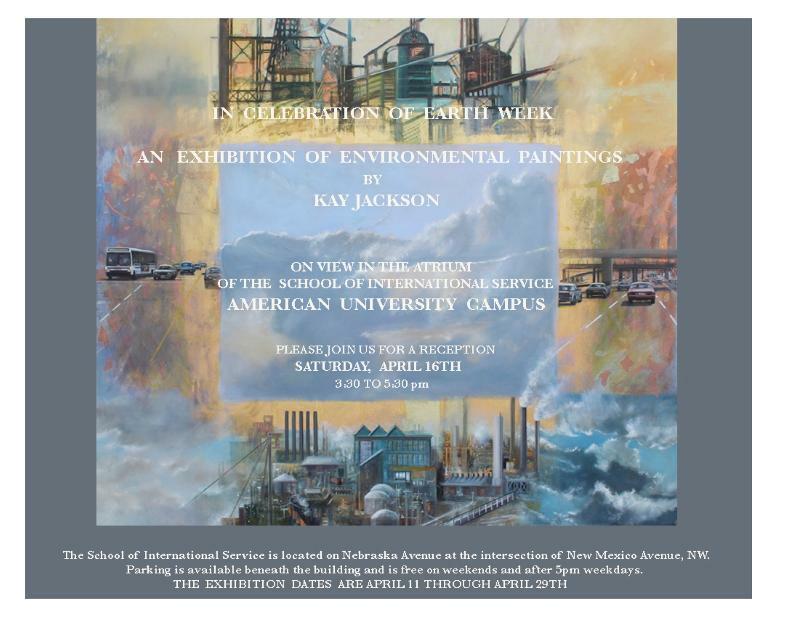 The School of International Service at American University is partnering with Addison/Ripley Fine Art to display work by well-known local artist Kay Jackson. This will be a special exhibition featuring a selection of Jackson's moving and evocative environmentally themed oil paintings hung in conjunction with the University's celebration of Earth Week. Jackson has built a distinguished artistic career with an international following. During the last twenty years she has focused on environmental issues and endangered species as inspiration for canvases created with old master painting techniques and gold leaf. Her artwork is in the permanent collections of the National Academy of Sciences, the Corcoran Gallery of Art, and the U.S. Department of State where she also lends paintings to the Art in the Embassies Program. The School of International Service is located at the intersection of New Mexico and Nebraska Avenues, NW. Parking is available beneath the building, or in the Nebraska Avenue parking lot opposite the main campus. Parking is free on weekends and after 5pm weekdays. 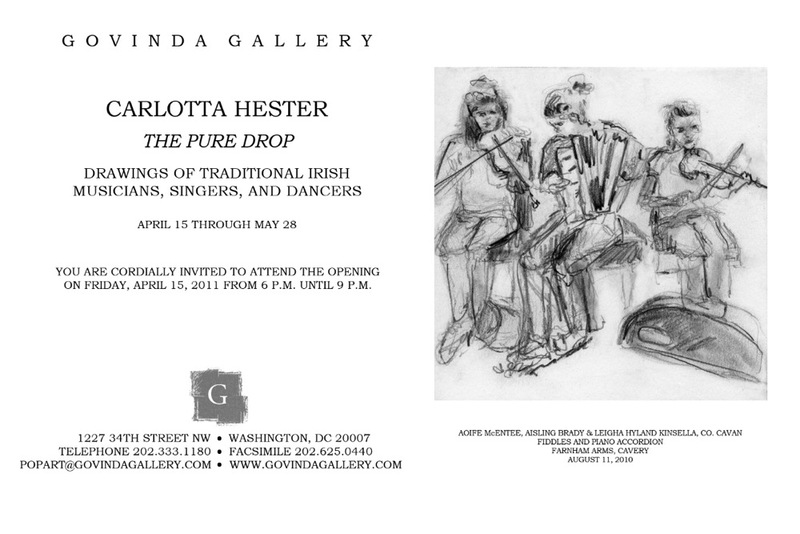 Opening reception: Friday, April 15th, 2011 from 6 to 9 p.m.
During the summer of 2010 Carlotta Hester made over 100 drawings in County Cavan, Ireland, documenting the largest of all traditional Irish music festivals, Fleadh Cheoil na hÈireann. These live-action drawings of musicians, singers and dancers were created in every festival setting including street sessions, theaters, dance classes, pub sessions, tutors' classes, outdoor concerts, cross-border sessions, and more. Musical artists from over 15 counties in Ireland (North and South), as well as Scotland, England, and the United States are depicted in these drawings. This exhibition is a tribute to the amazing artistry and remarkable spirit of traditional Irish music and dance, and the historic musical festival Fleadh Cheoil 2010. The show Runs through May 28th and the gallery is open Tuesday through Saturday 11-5 and by appointment. MIDPOINT, an exhibition of works by six artists in their second year of MFA candidacy at the University of Maryland. Showcasing the work of Selin Balci, Michael Booker, Felicia Glidden, Adam Nelson, Peter Karis, and Alexander Peace, MIDPOINT offers a glimpse at the diverse works being produced in the program. 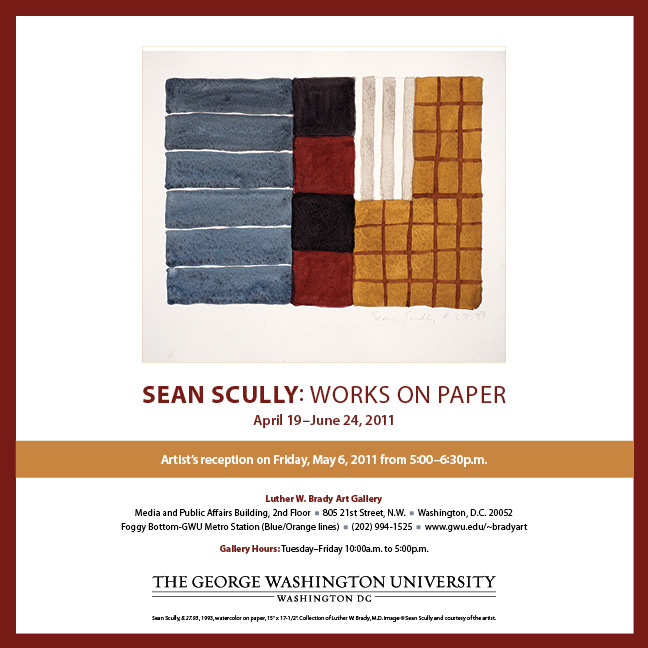 The Stamp Gallery is located on the first floor of the Adele H. Stamp Student Union-Center for Campus Life, at the University of Maryland, College Park. The gallery is free and open to the public Mondays-Thursdays 10:00am–8:00pm; Fridays 10:00am–6:00am, and Saturdays 11:00am–5:00pm. This panel discussion will explore how arts organizations can push exhibition practices beyond traditional galleries into alternative formats and will explore DIY artist initiatives that shape public experiences of experimental works of art. Topics will range from the DIY ethos to ephemeral, time-based media and from art fairs to guerilla art projects. The panel will cover both the philosophical and practical aspects of exhibiting art. The (e)merge conversations focus on the needs of emerging artists and galleries; past topics have included: how emerging artists build communities, artist representation, and the dynamics of artist – gallery relationships. (e)merge is committed to facilitating the careers of emerging artists by sharing information, initiating constructive discussions, and fostering inter-connectivity, among artists, collectors, curators, and gallery owners. (e)merge presents these educational events throughout the year, in addition to presenting extensive programs during the (e)merge art fair (September 22-25, at the Capital Skyline Hotel, Washington, DC). For more information, go here. Maryland Art Place presents an exhibition of works by contemporary artists exploring the boundaries between painting and sculpture, organized by MAP’s new consulting curator Michael Klein. New Wallworks will include works by Ann Agee, Stuart Arends, Luca Buvoli, Greg Colson, Ken Fandell, Charles Goldman, Greg Lamarche, Matthew McCaslin, Cordy Ryman and Rebecca Smith. Goldman’s new collection showcases the shapely amphora, celebrating our connection to ancient civilizations and the natural world. The show opens with a FREE nighttime reception with the artist on April 15, from 5-8pm at The Old Print Gallery, located on 31st Street in Georgetown. The night will give art lovers the chance to see the exhibit, as well as talk with Susan Goldman about her collection, process, and inspiration. Free wine and light refreshments will be served. The show will then be available for viewing until June 4, during normal gallery hours- Tuesday-Saturday, from 10am to 5:30pm. Used by the ancient civilizations to carry food, wine, and life-sustaining substances, the amphora can also be a metaphor for the womb of the earth. Goldman’s monoprints and woodcuts are a visual expression of this- her anthropomorphic vessels mimic the female form as it grows and nurtures new life. Goldman layers her prints with gorgeous sweeps of color and injects them with patterns of flowers, molecules, and spirals. Using symbols and patterns derived from the natural world, Goldman’s prints are apt for springs arrival- dynamic, vibrantly colored, and full of energy. Susan Goldman is Artistic Director of Lily Press, in Rockville Maryland, and is also Professor and Master Printer at Navigation Press at George Mason University in Fairfax, Virginia. Her prints can be found in major museums, such as the Kyoto City Museum, Smithsonian American Art Museum , and the Cincinnati Museum, to name a few. The Washington Design Center, Dream Home 2011 is featured on NBC Washington. Check out the Dream Home video and a glimpse of my painting, Swirl selected for Interior Designer Andy Staszak's family room, courtesy of the Art Registry. See the work and family room 4:41 minutes into VIDEO. The Washington Design Center partnered interior designers with local jewelers for this year's Dream Home exhibit. Each room's design is inspired by a unique gem. See Design Gem: NBC Washington Video. Hand-pulled prints - etchings, screenprints, monotypes, and mixed-media prints. This exhibit of hand-pulled prints—etchings, screenprints, monotypes, and mixed-media prints—comprises diverse images with grasses as their theme. In Janet Wheeler's work, nature’s endless cycle of renewal depicted through these nests…with a Twist! Plus work by 50 member artists. Do you have a passion for and experience in managing community-based art programs? For making art accessible to all ages and backgrounds? Do you have previous coordination experience? A knack for organization? Grant writing skills? If the answer is yes to three or more of the preceding questions, check out the attached ArtSpace Coordinator position and consider applying! Lilya, Green Tents, Acrylic and pastel, 38 x 50cm, 15" x 19¾"
Artist Talk with Seth Adelsberger and Closing Reception: Saturday, April 9th 4pm. Join Civilian Art Projects for a talk with Baltimore-based artist Seth Adelsberger as he discusses his exhibition, "Bordering on Painting," currently on view. 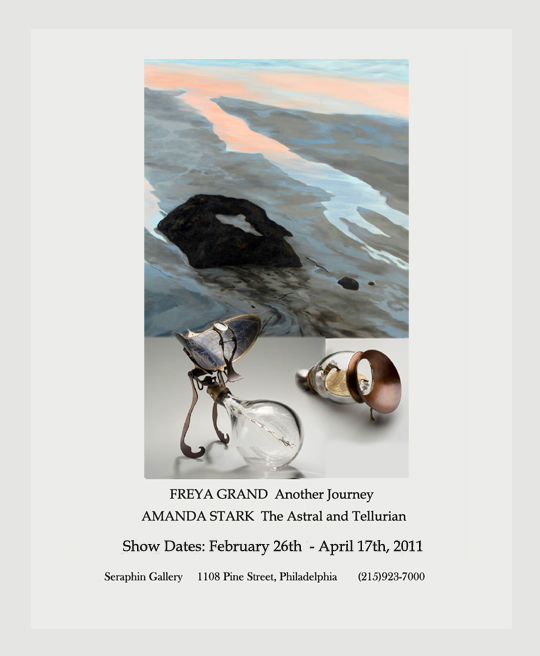 Artist Talk and Closing Reception: Saturday, April 9th, 4pm. Artist talks are the best way to dialogue one on one with the artist and learn more about technique, ideas, and opinions on art and artmaking. Don't miss it. Opening Friday, April 15th from 5 to 8 pm. Artist Rosetta DeBerardinis will launch her line of hand-painted shoes and accessories and introduce her abstract cityscape drawings. Accessible by the FREE Purple Circulator to Federal Hill, south of Henrietta St. stop #326. Tom Wesselmann Draws will be on view at The Kreeger Museum from April 8-July 30, 2011. 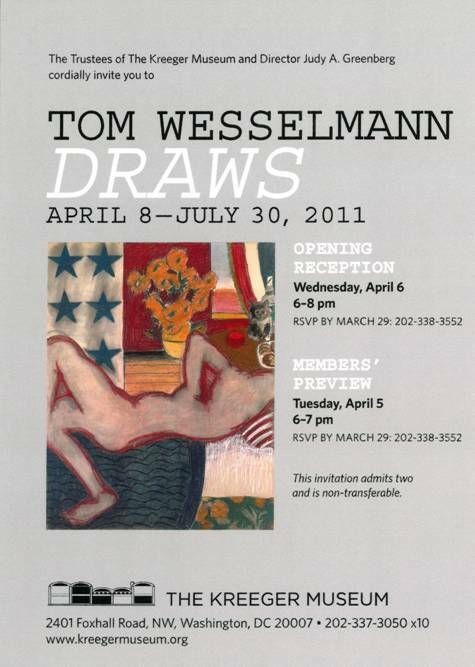 Tom Wesselmann Draws is the most comprehensive exhibition of drawings by the artist that has ever been assembled. Many of the 108 works have never been seen outside the artist's studio in New York. In the 1960s, Tom Wesselmann was one the key leaders in the Pop Art Movement along with Andy Warhol, Roy Lichtenstein, James Rosenquist and Robert Indiana. He was a brilliant colorist, superior draftsman and innovator of new techniques, who devoted his life to his art and his family." A short video featuring Claire Wesselmann, the artist's wife and muse as she leads a walk-through of Tom Wesselmann DRAWS at the Museum of Art Fort Lauderdale. 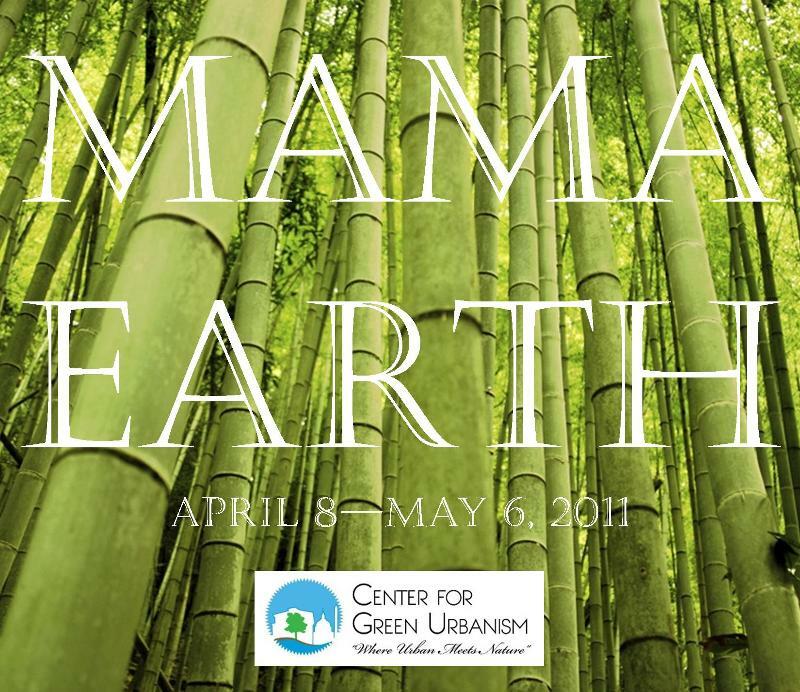 Mama Earth is a visual celebration of the beauty of the planet Earth. The show encompasses feng shui (literally meaning wind and water) - the Chinese art of placement to bring balance and harmony to a physical space (e.g. bedroom). Feng Shui is based on having good energy - called chi, and its positive flow. Throughout the exhibition, viewers will be able to enjoy the pieces from not only an aesthetic perspective, but also of chi and Feng Shui. Morgan Monceaux’s work exemplifies what it is to be a visionary artist. He has no formal training in art, and as a homeless person, lived much of his adult life outside conventional society. His work does not belong to a folk tradition but is inspired by a private vision that exists apart from traditional notions of art and art-making. His very first series of paintings, "George to George, the Presidential Portraits" has been exhibited in galleries and libraries all over the United States. Three of his "Jazz: My Music, My People" pieces are in the Smithsonian National Portrait Gallery's permanent collection. Morgan’s love of classical music led him to research and subsequently portray women of color who performed before Presidents, European Royalty and all white audiences over a century ago. He exhaustingly researches his subjects and his “DIVAS” series is big, powerful and like Morgan, compelling. For Cindy Packard Richmond, novelist and food writer turned painter, food has always been a central interest in her life. So when her creative passion grew to include the visual arts, it was only natural that she paint the subjects she wrote about for so many years. Richmond’s sweeping food-scapes are bursting with color, flavor, and an innovative perspective. “I am drawn to the bulbous shapes of food: the sweeping curves, tightening spirals, rounded edges, plumply ovate and corpulent.” For Richmond, design is the key element in her work, followed by color. Her choice of what to paint is purely visual – it’s all about the composition, color, and the strong design elements that form as a result of a particular composition. This fascinating new book introduces the virtually unknown story of Sufi (Islamic mystical) influence on the development of Jewish mysticism. From the inception of Islam (c. 630) to the Golden Age (8th-12th centuries) Jewish-Sufis of Arabia, North Africa and Spain, through the Kabbalists in Spain and the Holy Land, and then into 18th-century European Hasidism, Sufi ideas were at first knowingly and later unwittingly woven into the Jewish mystical quilt. More than just a historical work, this book provides a fresh perspective on the social, religious and political issues that have complicated Jewish-Muslim relations since the founding of Israel. There will be a book sale and signing following the event. Cash and checks only. For more information, contact Lynn Gittleson at 301-348-3840 or lgittleson[at]jccgw.org. Sarah Tanguy, curator at ART in Embassies, US Department of State as well as an independent curator and arts writer, will explore the expansive role of the curator in the emerging artist's career. Sarah Tanguy will cover various methods on how to approach, get the attention of and develop an ongoing relationship with a curator. She will also compare the role of the curator with that of a gallerist, and contextualize the place of an emerging artist in a global art community. That tomato in your salad did not appear immaculately. Every agricultural product cultivated through hard work and good luck is a grand victory that also negatively impacts the environment. For those of us sensitive to the natural environment, there is a kind of sadness that accompanies any appraisal of farmland. Yet in those open pastures, towering rows of corn and slowly grazing cows, we encounter an open border to nature unencumbered, wilderness pressing at our ambitious sense of order. Anne Rowland’s complex photographic engagement with the farmland around her home in rural Virginia springs from an instinctual feeling for nature and the inherent melancholy of our intrusion upon it. In her collection and mending together of visual data, Rowland points to a place in the human brain that desires to commune with and care for the wilderness. Collaboration with Pose 2 during Concrete Alchemy Tour on the facade of Benning Park Recreation Center. is hosted by Peter Krsko who is Chor’s collaborator and friend. You are invited to view the selected pieces from Chor’s solo exhibit for 5 to 10 minutes each. Then everyone meets for lunch to talk about their experience. This is a part of the global Slow Art Day. Sign up here for the visit to The Fridge. Opened in September 2009, The Fridge DC is an art gallery, performance space, music venue and classroom located on Barracks Row in the historic Eastern Market neighborhood of Washington, DC. Our mission is to foster creativity and community dialogue by serving as a conduit for expression through the arts and providing exhibition space to emerging and established artists. From exhibitions by well-known artists to shows by our DC youth, The Fridge is dedicated to making the arts accessible to everyone. As a music venue, The Fridge has supported everything from avante garde jazz ensembles and experimental electronic music to hip hop, blues, folk, and rock concerts. We have played host to a variety of performances- magic shows, comedians, dance, acrobatics, sideshows, poetry slams- and are home to weekly workshops focused on creating public art led by Albus Cavus. In the 1960s, Tom Wesselmann was one of the key figures in the Pop Art Movement along with Andy Warhol, Roy Lichenstein, James Rosenquist and Robert Indiana. He was a brilliant colorist, superior draftsman and innovator of new techniques, who devoted his life to his art and his family. Tom Wesselmann Draws is the most comprehensive exhibition of drawings by the artist that has ever been assembled. Many of the 60 pieces on view have never been seen outside the artist’s studio in New York. The Kreeger Museum is a private, non-profit museum located in the former residence of Carmen and David Kreeger. Designed by renowned architect Philip Johnson, it showcases the Kreegers’ permanent collection of 19th and 20th century painting and sculpture, as well as African art. 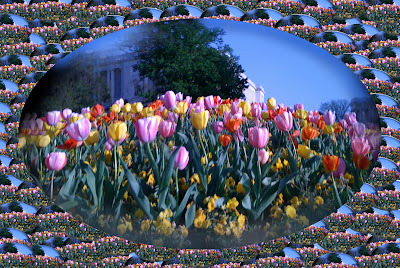 The Kreeger Museum is located at 2401 Foxhall Road, NW in Washington, DC. The Museum is open Tuesday – Friday by reservation only for the 10:30 am or 1:30 pm guided tour. Saturday open hours are from 10 am – 4 pm. For further information, call 202-337-3050 x10.